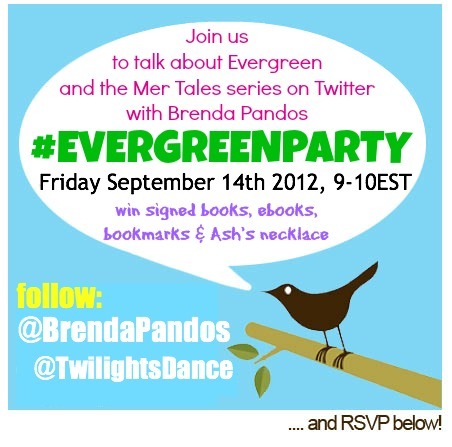 Here I am in all my geeky glory, answering questions from blog comments you've left during the Evergreen Blog Tour. Hopefully, I'm getting better at video editing. I enjoyed the video posts. I knew how you wrote and now I know how you sound. For the record, I have been a certified mermaid geek since the age of 5 and have worn a kilt for 30 years. On a more serious note, I would like to ask you a question about your vision as it pertains to Ash. It seemed to me that - post conversion - Ash appeared to do most things instinctively (like curling her tail around Fin - quite sweet & romantic) as if a lot of this was already built in to her. In your world, do you think that someone who has been restored to their rightful status - like Ash - would immediately fare better than a raw recruit like Fin's mother? Hi Brenda! Thanks for answering our questions! This was my first time watched the v-log and I loved it! It is so nice to be able to see an author answer my questions. I really have to buy Evergreen soon so I can read it. Btw did you anounce the winners of the contest yet?